Utilizing a network of interacting proteins, intracellular signalling pathways transmit various extracellular signals into the cell to regulate gene expression and induce different cell responses. With optogenetic design to optically control the interaction and function of signalling proteins, the corresponding intracellular signalling pathway can be activated by light. Nerve growth factor/tropomyosin receptor kinase A (NGF/TrkA) signaling plays a key role in neuronal development, function, survival, and growth. 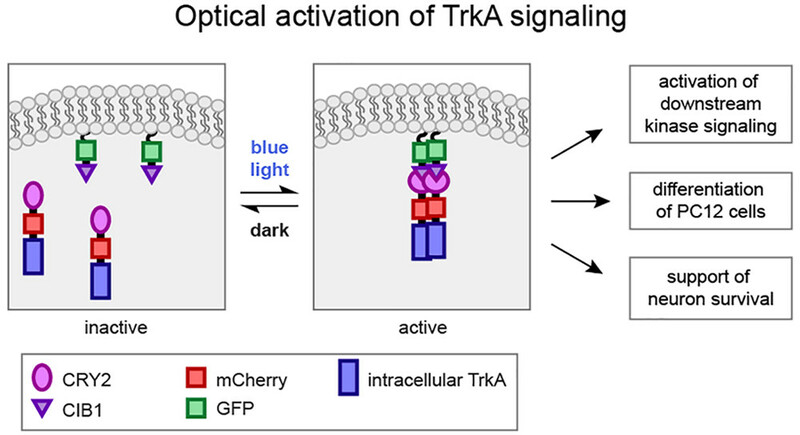 Based on the light-modulated protein-protein interactions, the optical control over TrkA sginalling is developed.